Ethiopian children have the most beautiful faces and hearts! Every time I see them, I want more than one. And this is coming from a woman who wasn't so crazy about the idea of adopting any kids from any country. I liked my comfortable, fairly predictable life. But boy has God worked His ways in me and given me His heart for the children in Ethiopia. 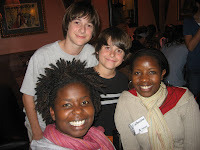 On Wednesday night JJ came home from a three day camping trip with Andrew and his whole 5th grade class. The first thing he did was run to the mailbox to see if the most updated DVD of waiting children had arrived. It was there! He took a shower and watched the DVD completely through without me. I was doing something (probably blogging) and didn't even know he was watching it. He made a list of girls that fit in our age range plus a few extra that he liked that are a year or two older. Then he gave me the list and asked me to watch the DVD. I was drawn to all the same girls he'd picked. Together we narrowed it down to nine and emailed their names to our agency. One set of siblings was already on hold but the rest of the girls were still available. I was hoping God would narrow it down a little more for us. There was only one set of girls (who are sisters) that are within the age range we stated on our home study. We prayed that God would show us what to do. Are these the girls He has for us? Or are we supposed to do an addendum to our home study and adopt one of the others that is a little older? We both went back and forth. We didn't know what to do or how to decide. So we didn't decide anything. We knew this wasn't something for us to figure out. This was a decision that had already been made before eternity was set in our hearts - before we had ever taken a breath - before we even knew that our lives would become one. For the past 48 hours we have been praying and pondering all of the possibilities. Our hearts have moved across the board and landed in more than one place. But separately God has brought us both back to the same place and we have made our decision! We are pursuing the adoption of two beautiful little girls who are seven and nine. I wish I could tell you more but we cannot share anything about them until we hear back from our agency and we are approved. I cannot wait to tell you their names and to show you the two beautiful blessings God has been preparing for us! My 13-year old son, the one that was oh so thoughtful during my "time of the month" in September totally hurt my feelings today. And it's been exactly one month since then so you can guess that I was quite hormonal and emotionally over reactive about it. I knew it was bound to happen and all of you who wanted to slap me because I bragged on my boys pampering me the day I had cramps can now laugh. And the rest of you with toddlers who are still snuggly and sweet can feel sorry for me because you can't imagine your child ever dumping you for his friends. I will take your sympathy and you can still be my friends. Today is the day my prince lost some of his charm! He completely blew me off and real tears actually dripped down my cheeks. Of course, I didn't let anyone see them. It was just between me and God, and now you. First of all, I know it's not even normal for a mom to go eat lunch with her 13-year-old. But he's been saying his friends' moms bring them lunch and eat with them. He kept asking me all week if I was coming today. I was feeling all cool like he wanted his friends to meet me or something. I got there and it was all good. He talked to me a little. I made small talk with some of his friends I'd never met. Twenty minutes later the lunch bell rang, he stood up and started walking away. "Are you just going to leave?" I asked. "Yea, I gotta go back to class." he replied as he turned and walked to the trash cans with his friends. No good-bye, no thanks, no nothin! Then I thought, He'll wait for me at the door. But oh no, he didn't. I couldn't find him. I looked toward the bathrooms, against the walls. Then I looked waaay down the hall and there he was walking and talking. Not looking back. Not even aware that I was waiting for a glance, a wave, a good-bye. I just watched and wondered. How could my sweet son be so rude? He didn't even thank me for bringing him his favorite food to school and he didn't even say good-bye. Doesn't he know I went out of my way to take a shower, find an outfit, put on make-up, drive to Chick-fil-A and then come find him in a sea of middle-school faces? I could've stayed home in my sweats all day, not even taken a shower and gotten work done! Well, see if I bring him any chicken nuggets again! At first, it almost ruined my day. I didn't want to do anything when I got home, but feel sad and take a nap. I know it's mostly hormones but when they hit you it feels so real and hurtful! Thank goodness for the Holy Spirit who nudged me to process my feelings and the facts with God. that important to my son anymore. My feelings told me that I'd been rejected. even though he's got 6 more years at home. he is a thoughtful kid (most of the time). this is typical teenage behavior. he was not rejecting me. one incident doesn't define a person or a relationship. I needed to pray for the opportunity to talk with him about what happened. And then I asked God to remind me of what is true. Joshua had run with me one evening this week when all he really wanted to do was stay home eat dinner and rest. considerate and giving Joshua was this week when a friend's daughter that I am mentoring/tutoring needed some extra time and help. By the time I had processed all of this, my hurt feelings were healing. I had forgiven him and I was able to live in the truth of God's love and the truth of Joshua's love - and pull from all the deposits we have in our relationship so that this one big withdraw wouldn't knock me into "insufficient funds." Now I just need to take what I learned today and apply it in all my relationships when my hormones, emotions and other people threaten to steal my charm! Today it's my turn to bless several of you with a prize, and give you a way "bless it forward" by sharing the gift you receive. But before I announce the winners, I just have to say that I've been incredibly blessed by your stories, ideas, commitments to help others and your sweet words of encouragement to me that have totally blessed my heart! Congratulations girls! I pray that God would bless you through these gifts and show you how He wants you to bless it forward by passing them on to someone else after they have blessed you! I hope you'll keep coming back to share how you are blessing it forward this week. I'll be sure to tell you what He's telling me to do and how I am following through. I'll share tomorrow about my coffee yesterday and how it was a Divine appointment God just happened to plan on the day I would be looking for ways to bless someone. He's so cool like that! You are blessed to be a blessing. So go bless someone today! How will you BLESS IT FORWARD? Welcome to the BLESS IT FORWARD stories and give-aways. If you don't know the details, be sure to read Monday's post to find out more so you can participate. I'll be giving away 5 prizes to bless 5 people and give them the chance to pass those blessings on to others. I cried through most of your stories yesterday. Isn't it amazing (and so encouraging) to see how God uses ordinary people to be an extraordinary measure of His love to others? So many were an answer to someone's prayers! 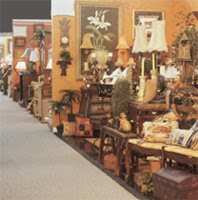 These stores are beautiful pictures of the gospel - Jesus' life in others. I love knowing that Jesus died not only to get us out of hell and into relationship with Him because that is the desire of His heart, but also to pour Himself into us so that others will be drawn closer to Him. I see that in the response of each recipient. They felt God's love through the blessings others gave. We all have something to give, big or small, and when we do we are just as blessed as the one we give to. It doesn't have to be monetary either. It could be something as powerful as a personal note of encouragement, a prayer email, a voice mail simply saying "I am thinking of you today or something as anonymous as paying for the order of the person behind you in the drive-thru window. So, how will you bless it forward today? I'll share what I plan to do in the post below: Blessed to be a Blessing. My friend Suzie always says, "I am blessed to be a blessing." She loves to shop and when she finds something she likes, she'll often buy one for someone else, too. Or if someone mentions they like something she has, she'll sometimes just give it to them. My friend Zoe is known for this kind of kindness, too. She is constantly taking off her jewelry, slipping off her shoes or emptying her purse to give it to an admirer. I am so blessed to know these amazingly giving women! My friend Lysa lives this truth in a very powerful way as well. Although she has also been known to give away her favorite things, she has blessed me the most through the power of her encouraging words and through the invitation to share the blessings of ministry and life. Lysa has a way of seeing beyond who a person is to who they can become. She believes with all of her heart that God has a dream for each woman and she loves to help a woman discover that dream and equip her to accomplish it. She has done that for me and countless others! What I love is that Lysa doesn't try to make those dreams come true. She knows that is God's part. But she gives of her time, her talents, her wisdom and her encouragement to create a setting where a woman can listen to God and see how He is leading. 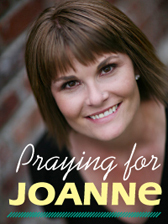 She does that through her blog, her speaking, her books and through a conference P31 hosts called, "She Speaks." 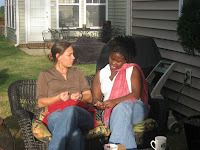 Lysa always looks for ways to share her ministry blessings with others. If God opens a door of opportunity, one of her first thoughts is, "How can I share this with others? Who could benefit from this opportunity as well?" She's told me she once her Truett Cathy, founder of Chick-fil-A, say that if you help enough people fulfill their dreams you will eventually fulfill yours. I have never known anyone who lives that principle as passionately and as purely as she does. So, today I want to bless it forward by praying that God would show me how I can help someone see beyond who they are to who they are becoming in Him, and encourage them in their dreams. I don't know what that will look like, but I am listening and looking for His direction today. In fact, I am on my way to meet a new friend for coffee, I wonder if it's her! I pray you are (or will soon be) having a blessed day. If you linked here from my devotion The Power of Encouraging Words, I'm so glad you stopped by! I'm amazed at what God can do with encouraging words. They can literally change the course of someone's life. I know because they have mine. More about that tomorrow. 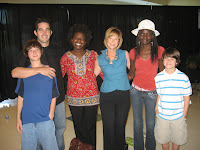 A few years ago, my friend Carrie came up with the idea to "Bless It Forward" inspired by the movie Pay it Forward. Today I pray that we'll bless each other forward by encouraging and getting encouragement through the stories and lives of women around the world!! First, I'll be giving several of you a gift, and then I want you to pass the blessing on when you are finished being blessed by it. The blessings will include a P31 autographed book, a worship CD, a teaching DVD, a P31 woman magazine subscription and $10 Target card. Second, being part of the first blessing has a two-fold purpose. To enter to win, I want you to share how someone's encouragement in the past has impacted your life, and in turn you will inspire others to bless it forward by encouraging someone they know today. Let's get started. Click on "comments" below this post. Type your comment. A white box will pop up where I'd love for you to describe one way someone has encouraged you - either another person or something God did. It doesn't have to be anything big. Just something that brought encouragement to your heart. God will use your story to show others how they can encourage someone today. Include the following details: your state and/or country, your name if you want to, and be sure to leave your email so I can contact you if you win. Post your comment. Click on the orange button to post it. If you don't have a blogger account, simply click anonymous. Take time to read the other comments and ask God to show you an idea and a person He wants you to encourage today - either through a note, a call, a text message, an act of kindness or something you get here. Come back tomorrow to tell us how you have or will bless it forward through the power of encouraging words this week. To remind yourself to come back, scroll down the right margin and sign up for bloglines. You'll get a notice in the morning when I open up my blog for new comments and more chances to win! With today's comments I'll draw 3 winners and with tomorrows commitments I'll draw the other 2 winners to bless it forward. I'll do the drawings and announce Wednesday morning who the the winners are for my "Bless It Forward" give-aways. I can't wait to see what God will do. If you are new to my blog, welcome! 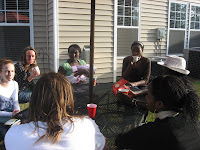 I am in the middle of telling about an adventure God took me on this month when my family hosted some women from Africa. The story starts here. 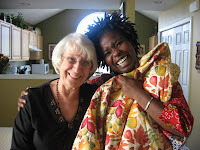 For those of you who visit often, thanks for your friendship and for praying for my time with the women from Kenya. I left off last week here and continued here. I am going to indulge in some writing today. As I tell the rest of my Amani story (which is in order from top to bottom) I pray for words to describe how God's presence invaded new places in my heart and soul. I find myself wishing I could've told you as it was happening, so that you could journey with me and so that it wouldn't feel like so much to tell now. I hope you won't tire from reading it all. But then again as we re-tell our stories, we relive them and in reliving them, we can see the hand prints of God more clearly than we could while it was being written by Him. For those of you waiting to read, "The Story Behind the Steamer," I will tell the in-between parts because they make the ending that much better, but if you want to skip ahead the post is the last one for today. My prayer is that as you read my story, you will hear Him inviting your heart to trust Him more in your everyday adventures of faith. There was a theme of "pressing" during my Amani week. I was pressing wrinkles out of clothes and probably pressing Christen's buttons as I displayed my lack of skill in the retail clothing area. But more than that I was pressing into God, listening for His direction in my heart of what I should be doing. I'd been pressing into His heart for peace in the days leading up to their visit, too. Call me crazy but it didn't dawn on me until about the week before they came that I was going to have two complete strangers sleeping in a room upstairs near my children's bedrooms. Our master bedroom is on the main floor and tucked back in a corner so that we cannot hear a thing. I didn't know anything about these women except that they came from very traumatic backgrounds and lived in war-torn areas. I didn't even know who was staying with us until they arrived. One night I got so concerned that I almost gave up my spot to be a hostess because I knew there was a waiting list of families who wanted my guests. As I lay in bed praying, I traced my decisions back to the day I sensed God calling us to invite them into our home. I then made a promise that I would not walk in fear but faith. I can see now that those whispers of fear were the enemy trying to talk me out of blessings God wanted to lavish on us. It wasn't just them staying with us that made me nervous, it was this overwhelming sense of being totally out of place and completely inadequate. I don't like to feel like I don't t know what to do. I like having at least a little bit of competence but it would not be so. You see, I'm not naturally gifted at reaching out to people of other cultures. I don't know why. I tend to fumble on my words, get concerned I'll say the wrong thing, ask the wrong question and offend someone. I am also terribly geographically challenged and tend to embarrass myself. Inviting women from a country I know very little about who speak a language I have never even heard and eat food I don't know how to cook made me feel like I could fail very easily. But you know what - it was the best weakness I could have had because it left me completely dependent on God every minute they were here. For the first time in a long time, I could hear God's voice whisper so clearly and consistently in my heart for almost a whole week. I guess that is what happens with daily dependence. I would ask, "Lord, tell me what to say." And He would. I would ask, "Lord, what should I do in this situation, should I go sit there or over there? Should I try to fit in or stay back and just observe them together." Even when I felt a little odd in the crowd, I'd tell Him "I feel kinda lonely now, help me feel Your presence or teach me something through this uncomfortable emotion I have." I;m so thankful I did not listen to my fears and miss the sweet, sweet opportunity to see the and hear the heart of God - in them and in me. It was the most wonderful time of abiding in Him that I've had in quite a while. I don't want it to end now that they are gone. I don't want to go back to knowing my way around and turning to Him for help only when I can't figure out what to do in life's challenges. I want to talk to Him about everything now - I mean EVERY THING! But it's so easy to forget. 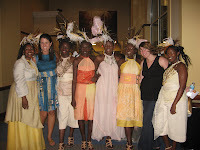 Friday night, Oct 10th, was the big event: Sankofa - Looking Back, Walking Forward - a Fashion Narrative. It was indescribable! 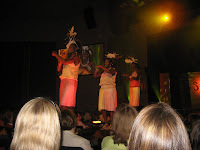 One thousand women filled the sanctuary, enthralled by the women's beauty and captivated by their stories. 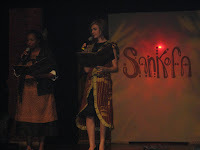 Here are the two directors introducing the show, Mary from Kenya and Rachel from DC. 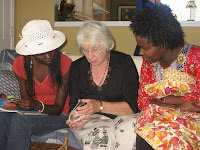 Three women gave a narrative of three different stories describin g what has happened to many of the women who come to Amani in Kenya. 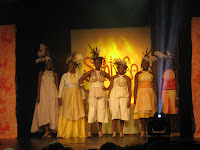 Each story was told in three parts and the clothes reflected the emotion of the stories of - Separation, Transformation and Celebration. One woman described how she gathered her children in the middle of the night and hurried them to the car. They drove for two hours before she told them that they had just left their home for the last time and would never return again. Another described how they were running and falling and hiding. How after days they were so hungry but they had no food, no water. She scooped her hands together and dipped them into a mud puddle just to get something to drink. Another described the lines in her heart that she had drawn within, where she would never let anyone cross again. They got a standing ovation after the first set of stories and fashions! But it was only the beginning. During the next set they described stories of forgiveness and healing as they relinquished their rights to be bitter and to hate the men who had killed their families. This was where they told of transformation through the hope and healing love of Jesus Christ. Where they learned to trust again. To make friends again, to live and breath again. Where they found the strength to tell their stories and to share their pain with one another, knowing they were not alone. Their costumes were changing from dark to colorful and their personalities were becoming more playful. The next phase was celebration, highlighting stories of new beginnings. Honestly, I don't remember much of what was said from that point on in the narrative because I was totally captivated with the glory of God that shone in their faces, beamed from their eyes and radiated in their smiles. 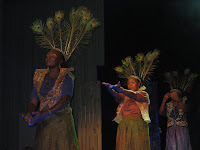 Their costumes and their countenance depicted true beauty! I have NEVER experienced anything like it. It was an unbelievable night! Afterwards, we gathered in the hallways taking photos and giving hugs. There was something different about the way we saw each other now. It was a turning point in our relationships with each other. They had shared their stories and maybe now it was time for us to share ours. It was as though we had invited them into our homes and now they were letting us into their hearts on a whole new level. Bonds of sisterhood and friendships were forming. I wondered what God wanted me to do next. "Keep loving and serving them." He whispered. We stayed until midnight dismantling the set, taking down hair-dos, organizing costumes, removing items from the boutique and packing boxes so the U-Haul could be loaded the next day in preparation for their next show in the Washington, DC area. I couldn't believe it was almost over and they would be leaving soon. 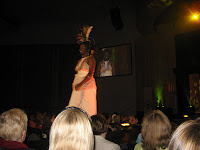 The Amani women were scheduled to go to VA to see their US warehouse the day after the show, but that got canceled. We knew they wanted to go shopping so plans were made for us to meet at the church and caravan to local thrift stores, Chick-fil-A and Target for the day. 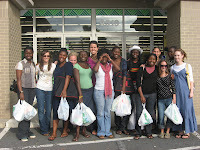 Here they are with their wares in front of the Dollar Store. I only lasted about an hour. I was so tired!! We also had family coming in town for lunch on their way to a wedding so I went home to meet them. After eating at Panera, I headed home to take a little nap. Just as I was getting ready to lay my head down, I thought about how tired the Amani women must be. They didn't really have anywhere to go other than lunch and shopping since host families had been told to meet back at the church at 6pm. It was only 3:30. That's when another gentle whisper from God's heart went through my thoughts - "Invite them over here for afternoon tea." All 10 of them and the tour team? "Yep, all them." As tired as I was, my soul flooded with a "yes" to the thought the thought of our home being a resting place, a refuge from the wear and tear of ministry and shopping. I envisioned blankets on the lawn for them to lay on and tea in their hands to sip. And God made it so. It didn't matter that I didn't have enough cups nor any snacks to serve. It didn't even matter that dishes were in the sink.I no longer wanted to sleep. I wanted to have my new friends over. I called Hannah, their coordinator, and offered the invitation. To which she sighed relief and started making plans while I made my way over their to meet them. That afternoon they filled our home with their beautiful smiles, infectious laughter and tired soles. It was another beautiful and unexpected gift from Him. Another fun part of the afternoon is that their "road crew" came with them. These three amazing guys work who for Samaritan's purse and lived in the Sudan for 2 years, served as part of the Amani tour by driving a U-haul filled with all of their costumes, stage set, boutique set and products - from Missouri to Tennessee to Florida to Texas to North Carolina to Washington, DC and then back to TN. My boys had so much fun hanging out with them. 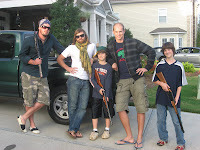 They showed them the woods out back and invited them to shoot their bb guns. Are they cool or what? 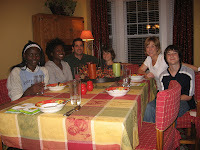 Saturday night we had a family dinner with Stella and Mary, our guests. I'd cooked a roast in the crockpot all day since I'd heard they love beef stew. By the way, they were so easy to please. Fruit and bread in the morning, pizza and Chick-fil-A for lunch and a variety of things for dinner. That night I asked if I could give them some clothes and assured them the other families would be doing the same (and they did). I also had a few necklaces to give to the other women. Stella's smile brightened and her shyness faded as she stood in my bedroom parading in front of a mirror. Diamonds are overrated! I am now convinced clothes are a girl's best friend. On Sunday we collected fall leaves and pressed them in wax paper for Mary. She loves fall leaves. One of her dreams in life was to see them and here she was in NC in October. Now she could take some home! We went to church (here we are in our cafe-terium sanctuary. Our church meets at a school). Earlier that morning I sensed God wanted me to ask my mom if I could bring the girls by to meet her before they left. She invited us to stay and then spontaneously made this delicious meal. My mom's a great cook but she is usually very shy about having people over. I had not even considered this idea. It was all HIS! Mom beamed with joy the whole time we were there. 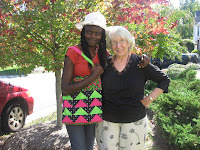 think God is preparing her heart to be a grandma to some sweet African girls. I watched such a beautiful outpouring of love as she gave the girls a tour of her home, which looks like a quilt museum. She showed them quilting magazines and gave them each a quilted gift. Look at the details of God's plans. Stella's favorite color is pink and as you can see, Mary is crazy about leaves! She almost cried. Saturday night when I went to bed (after our family dinner and private fashion parade), my heart filled with such sadness knowing that they were leaving the next day. I asked God to stretch out the hours on Sunday until they headed to the airport at 2pm. As you can read above, He did! I lay in bed thinking, "This can't be it. I don't want them to leave. Lord, I don't want this to end. I want to go with them. I want to see the show. I want to see them again. I'm not ready to say good-bye." All I could do was pray that God would make my heart ready or make a way for me to see them again. I told them I was going to pray for God to provide a way for me to go to DC. When I got to the church to drop them off I told Hannah, their tour coordinator and she said it would mean so much to the women. I told her I didn't know how but I knew if God wanted me there He'd make a way. I hugged the girls and told them I would try my best. It was a bitter-sweet good-bye. As they drove away in the shuttle bus, Christen came up to me and said, "I heard you say you want to go to DC. I have been feeling the same way. My husband is a pilot for Air-Tran. I can get a buddy pass and I may want to go with you." My jaw dropped and a glimmer of hope came over me. I really didn't want to go alone. Maybe this was God's idea and not just mine. Maybe I could find a good rate and we could fly together. I fluttered between excited and shocked. We traded phone numbers and said we'd pray and touch base. It was Sunday, I'd need to leave in a few days. I came home and checked online. Tickets were $400-500, plus hotel, car, food, etc. Too much to spend. I went running that night and prayed that God would show me what to do. I looked into the night sky for a sign - a shooting star, a meteor, something. Nothing happened. I kept running and praying. It was beautiful and cool outside. I prayed for the women. I asked God to show me what He was doing in me. Why was my heart so full? Why did I have this longing to experience more of what He was doing through these women and in me when I was with them? I went to bed that night at 10:30. I was reading a book called "Left to Tell" about a woman who survived the genocide in Sudan. It made me miss the women that much more. Then I felt like God whispered - go check your email. So I climbed out of bed and powered on my laptop. I thought maybe Mary or Stella has written to me. But there in my inbox was an email from Christen saying she could get ME a buddy pass and it would only cost me $55! I read her email to JJ, who then looked at me and said, "Well, there's your answer." There is more that happened lead up to me flying to DC that Friday - five days later! I wavered between going and staying because some other things threatened to get in the way - BUT GOD!!!!!!! He made sure I got there. It was amazing and I will have to brag on Him and the details this week. He gave me a special role to play in serving them and loving on them for another 30 hours before they headed back to Africa, where they are now. If you read this story all the way through - WOW! Thanks for sticking with me! I truly believe God has daily adventures for each of us if we will step out of our comfort zones and listen to His voice in our hearts. I like my safe little life but it's so boring! And all those questions of why I didn't want it to end... I figured out that it was HIM that I was hooked on most. His nearness. His direction. His presence. My absolute dependence on HIM. It must be why Moses was so insistent about not going anywhere unless God went with Him. I think I am getting it and here I thought I already knew. He has so much more for me to learn. So sorry to leave you with a cliff hanger from my last post. I was going to continue the story on Thursday but life swallowed me whole that day and I didn't get to before I left on Friday to go out of town. I was speaking this weekend at a women's retreat in the NC mountains and well it was a little hard to get a connection from my room. So here I am in bed snuggled up with my warm laptop about to go to sleep and I just had to tell you where I've been. Reading your guesses about how the story will end has been fun. I'll go ahead and let you know that Kristen didn't have any connections in Ethiopia and she didn't know any orphans that needed a home. Wouldn't that have been amazing? FYI, we're still waiting on news from our agency about where our paperwork is in the process. We should be getting a new DVD this week of kids waiting in the orphanages our agency works with. Okay, I promise to tell you the rest of the story tomorrow. My eyes are crossing and my body is begging for some sleep. Hi to all my new friends from the ARP churches of NC - you are some of the most precious and encouraging women I have ever met! I loved being with you and hope we can keep in touch! 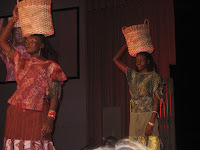 God's plans for my time with the Amani women unfolded in ways that I couldn't have planned. It was abundantly more than I had asked for or imagined. I had originally only signed up to be a hostess. I thought it would be great to meet some women from Africa and invite them to stay in our new "girls" room. Then I felt called to help with the tour which ended up including a very special tea time for the P31 staff and Amani team. Each day held a special assignment specifically planned by God. On the day after our tour of Charlotte, I dropped off Stella and Mary, the women staying with us, at the church. 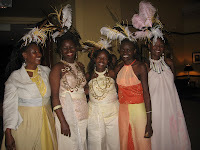 Several volunteers were there helping set up the boutique where the Amani products would be sold after the fashion show. My friend Lisa invited me to join the women for prayer and a light lunch. I had planned to catch up at work that day and return that night for the fashion narrative, but I sensed God had other plans. Only it wasn't the invitation to go pray. Oddly, I sensed that I was not supposed to go pray with the women. Instead I felt God telling me to roll up my sleeves and start working. I was kind of disappointed. I really like to pray with friends and I really like to eat with them, too. But there were clothes, tote bags, jewelry and crafts all over the place in the church atrium. So I started sorting and hanging things. During my time helping I overheard someone say they needed another steamer to get the wrinkles out of the clothes the women would be modeling that night. Hmm, I thought, surely I know someone with a steamer. I made a few phone calls and left messages. I had been working for about an hour when my stomach started growling really bad. I had finished hanging the huge box of clothes I was assigned to so I walked over to where the food had been served. The women were just finishing lunch. As I took my first bite, my friend Lisa stood up and asked who could stay around to pray with the group. I hadn't missed it after all! I quickly finished eating and moved into the circle of women to join them in prayer. We spent the next 30-40 minutes praising God for who He is, thanking Him for all that He had done and asking for His anointing on all that He would do during the night as women came to hear the stories of women who had found the God of all hope, who had been rescued from darkness and despair, and called to declare His glory and praises. It was a time of listening to His spirit lead us in worship through praying together. It was beautiful and my heart overflowed with thanksgiving. God knew just where I needed to be, and when I needed to be there. After we finished praying, I sensed in my heart that God had another assignment for me. I headed back into the sanctuary foyer to see where my help might be needed. There I saw the a woman still steaming the models' outfits. God gently whispered to my heart to find another steamer. I hadn't heard back from any potential steamer-owning friends. So I just prayed as I walked around looking not-so-helpful. Then an old friend's name popped into my head. Kathy! She makes custom drapes. I knew she'd have a steamer and she lived close by. But I didn't know her number. I went up to the church office and found someone who had access to the church database and got her number. I called Kathy, who just happened to be home. Her sisters were in town and they were getting ready to leave for some sight-seeing. I told her our need and she gladly gave me directions to her house. Within 20 minutes I had a steamer in hand. When I got back to the church, I approached the women using the very fancy steamer machine thingy. She looked so professional. I assumed she'd been recruited by the staff as the expert steamer. I didn't know what to do with my little portable water boiling, steam-shootin contraption. So I sheepishly offered to help her steam if she'd help me figure out how to work it. I am sure about that time she was wishin' I had not been so willing to find my portable steamer. Bless my heart, within 5 minutes I knocked over the thing, spilled water, spewed steam bubbles on the clothes and actually managed to put more wrinkles in to the fabrics than I was able to get out. Finally the sweet steamer lady told me that what she really needed was for someone to put the costumes on hangers, hold the fabric out flat and move them to the "ready" rack when she was finished with each piece. I think she fired me from my job! Or maybe it was more of a demotion. Even my new assignment was a bit of a disaster. Clothes kept falling off hangers and I knocked over a whole full rack of "ready" clothes! I quickly confessed that this was not my calling. She smiled as we finished the last piece and then said, "My name is Christen. And you are....Renee Swope, right?" I almost lied. It was so tempting. I didn't have a name tag. She didn't need to know. I considered the "witness protection plan" as a cover up. You know, protecting my witness for Christ and for the ministry I work for called Proverbs 31. The one that esteems the Godly role model of a women who served God and her family by making beautiful fabrics, working at her spindle and holding a distaff. I don't even know what a distaff is but I now have this feeling it might be what they used to get wrinkles out of fine linen, and I would surely be a disaster at that, too. Well friends, when you give this girl a steamer you end up with a story, a God-story! There is more to this one. I have no doubt God sent me to go get that steamer, even though we barely used it. It was the tool He used to introduce me to Christen and wait 'til you hear why! It's hard to believe that God could love me the way He does. It's hard to believe that no matter what I do, His love will never fail, never change, never end. It's hard to believe that He delights in me. That He just likes to look at me and watch me with love in His eyes, even when I am not doing a thing. It's hard to believe that even though I've broken His heart, betrayed His trust and questioned His ways...He still loves me!!!! It's hard to believe but it's good to know that it's true! I want to be a woman who not only believes in God, but really believes Him. I want to really live like His love is true. As I promised in my devotion today at P31 and Crosswalk, I wanted to share a few of my favorite promises of His love from His Word. Will you join me in allowing these words to pour over our hearts and minds and let them become our truths. How are you knowing and relying on God's love today? Are there verses God's given you to remind you that your heart may say one thing but His heart says another...You are loved!!!!!! I would love to know your favorite "love note" verses. I am just now catching my breath after an amazing, jam-packed four days with the Amani women. When they left on Sunday afternoon my heart was so full. I had indescribable joy, peace and fulfillment. It was as though the very breath of God filled my Spirit in a new way. It was some of the sweetest "abiding in Him" time I have had in months. And it wasn't because I was sitting in my favorite chair reading my Bible for hours. It was because I was absolutely dependent on Him for direction in each and every moment. I was so out of my comfort zone but yet so comfortable in that place of the unknown because I knew He was right there. I could see Him in their faces, hear them in their laughs and sense Him in all of the blessings that were being lavished on them and on us during their time here. Dont' you just wish you were here with us? Me, too! After we left the P31 office on Thursday morning, we took the beautiful tour bus to the Black Lion, a multi-merchant gift, home furnishings, and design center. It is one of my favorite stores to just walk around looking, dreaming, shopping and eating. They greeted us with personal pre-printed name tags, menus to take our orders and then took us on a a grand tour. The women had so much fun. Here they are at our first stop - at the room with wall to wall lazy-boys! 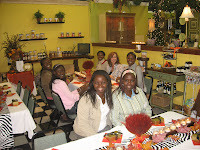 During the tour the store owner, Bob Emory, shared with the women that they want to open a booth to display Amani products free of charge with all proceeds going back to the ministry in Kenya. At the end of our tour, they led us to a beautiful luncheon area they had set up, and then gave each woman a $25 gift card to shop and a gift bag. 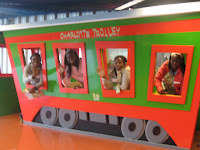 After we left the Black Lion, we headed downtown to Imaginon, the home of Charlotte's Children's Theatre and Children's Library. It's an amazing place - full of books, colors, artwork, and so much more. The women kept touching the books and looking through them. I don't know that they have ever seen that many books in one place. They also posed for a fun shot with Paddington, the storybook bear. After Imaginon, we walked to the Mint Museum where they were having a jewelry a nd craft exhibit. From there the women road the Links, our electric mass transit system and then we headed back towards our part of town where we met our families for dinner at Wolfman Pizza. 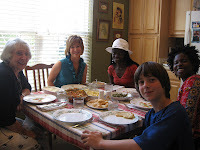 My boys really enjoyed getting to know the women who sat at our table. It was such a fun day and I would soon discover that the next day would be just as special. A business owner in Charlotte, who loves the Lord, very generously donated his luxury tour bus and a driver for our day with the Amani women. Oh my goodness!!!! What a sweet way for God to lavish abundant blessings on these special women for the next several hours. It had leather seats, granite counters and tables, four flat screen televisions, enought seating for probably over 30 people, a full kitchen and bath. We were all in awe. They felt like royalty - and they were! The first stop of our tour was Matthews, NC for a tea at the P31 office. We were greeted by our wonderful office staff and some in-town speakers on our team. While we were all together, we took time for a quick photo. 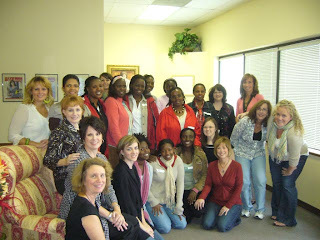 Also, joining us were some American women who have served as missionaries at Amani in Kenya. Why a tea? Well, Kenyan's love tea! They stop to have tea each morning at 10am and again at 4pm. They also like to drink it before bedtime and any other time they want to slow down. My sweet friend Mary explained that tea is what brings them together to talk, to reflect and to stop from their busy days...just to be still. They call it Chai but it's not like our Chai tea. Chai simply means "tea". They make it with breakfast tea and lots of hot milk and sugar. We also wanted to give them a gift, so we de cided that each of us at P31 would buy a special tea cup for each of the Amani women. The cups were as unique and beautiful as the women who would receive them. LeAnn lined them up to display as the women came into our small lobby. Each one also had a verse tucked inside. 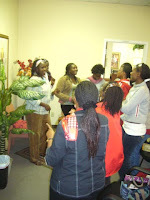 After we ate, they sang some African songs about Jesus for us. 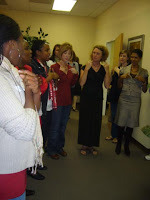 Then they taught us one and showed us a few hand motions. It was so much fun. Tonight is the fashion show! I've been gone all day helping set up at the church so I need to get ready real quick. But I will share more soon. P31 was only our first stop! Meet my new friends, Stella and Mary. 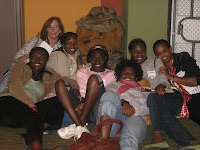 Mary is from Kenya and Stella is originally from Sudan but now lives in Kenya. 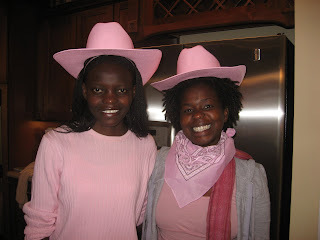 All 13 of the women from Amani arrived last night from Dallas with pink cowboy's hats and lots of luggage. They were teaching us how to "line dance" and greeted us with smiles and hugs. It was a fun night. This morning we are headed out to the big city of Charlotte for a tour. 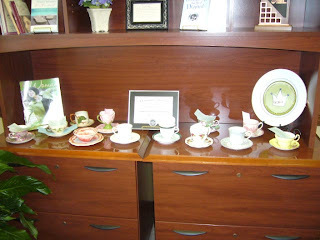 Our first stop will be the Proverbs 31 Office where we are having a "tea." I'll post more tonight. Will you pray for our day - no rain, lots of laughter and sweet fellowship with our new sisters! Last week we featured a devotion at P31 about the power of ONE. We also emailed a letter to our devotion readers inviting them to partner with us in prayer and to financially support what God is doing through Proverbs 31 Ministries. The response has encouraged our hearts in ways we cannot even describe. That same morning there was a message on the office's voice mail from a woman who was going to end her life the day before. She was hopeless...but God. The day before she had read our devotion about God's healing, and she found hope in Jesus - the One and Only. The timing of this campaign and the stories that followed were perfect, and God knew it. As you know, ministry is hard. It gets lonely, we get exhausted at times. At Proverbs 31, the number of lives we touch far exceeds our capacity to do so. It's much like Jesus feeding the 5,000. He takes the little we have in staff and time and multiplies it beyond our imagination. Last week was a powerful reminder about the difference we can make as a ministry and the difference we can make as one person for one life, one heart, one person at a time. If you'd like to read the the devotion click here. If you'd like to find out what a difference your partnership with P31 can make, click here and if you'd like to support the ministry click here. Thank you for your prayers for us and your prayers for me. I also wanted to let you know that I am finally starting on my book proposal and sample chapters this weekend. My topic is on how we can live beyond the shadow of our doubts. I'll keep you posted on my progress, and I'll be turning to you for wisdom, insights and prayer as things get going.